Mark an email address as low priority if they send you emails that don't need action right away. In Triage you can mark an email address as low priority by clicking on the email’s options menu and selecting ‘Low priority’. 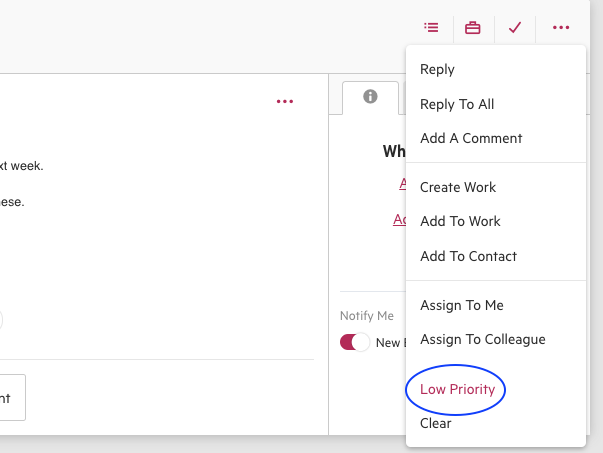 This will set the sender’s email address as low priority and all future emails from that address will automatically sit in your low priority section. This is useful for emails that don't need your attention right away, such as newsletters. If you decide that you no longer want the email address marked as low priority, click on the options menu and remove the low priority setting. All future emails from that sender will revert back to being delivered to Triage. Consider sending newsletters, invites to webinars, and things of that nature to Low Priority so that you can narrowly focus on client emails. Be sure to visit Low Priority weekly, if not daily, to action these emails or clear them out in bulk.